Get your interior décor off to a flying start by using our silver double toggle switch. You literally can’t go wrong with these fabulous switches. We’ve designed them especially to add an authentic industrial style finishing touch to any interior. If you’re not sure which toggle switch to go with, this is probably the one. It’s a safe, and uber stylish, bet. Our silver toggle light switch wouldn’t look out of place in a 1930s factory. Industrial lighting design was just about taking off around that time although it wouldn’t have been known for residential use. Luckily for us, things have moved on and we’re able to introduce a bit of that utilitarian chic into our own interiors. Our modern eclectic design tastes mean we crave the mixing of design styles from different periods in time. It’s tricky to do but looks amazing when done well. 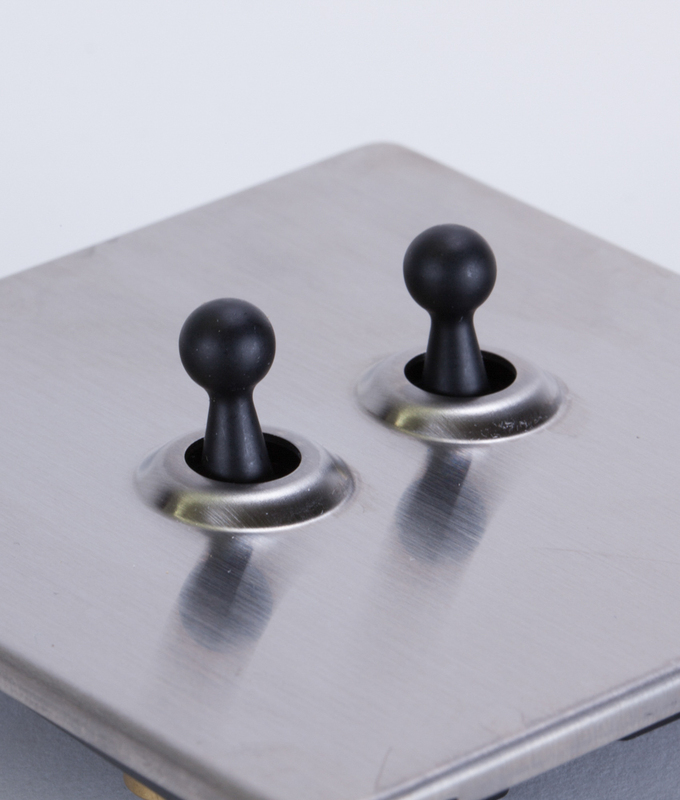 Our authentically retro industrial toggle light switch 2 toggle silver & black has a brushed steel plate with black, white, silver or gold toggles. These switches are designed by us and sold online exclusively by us, so you can be sure that we’ll have more of them if you decide to do another room, and also you won’t find them in every other place you visit. Being different is definitely good. 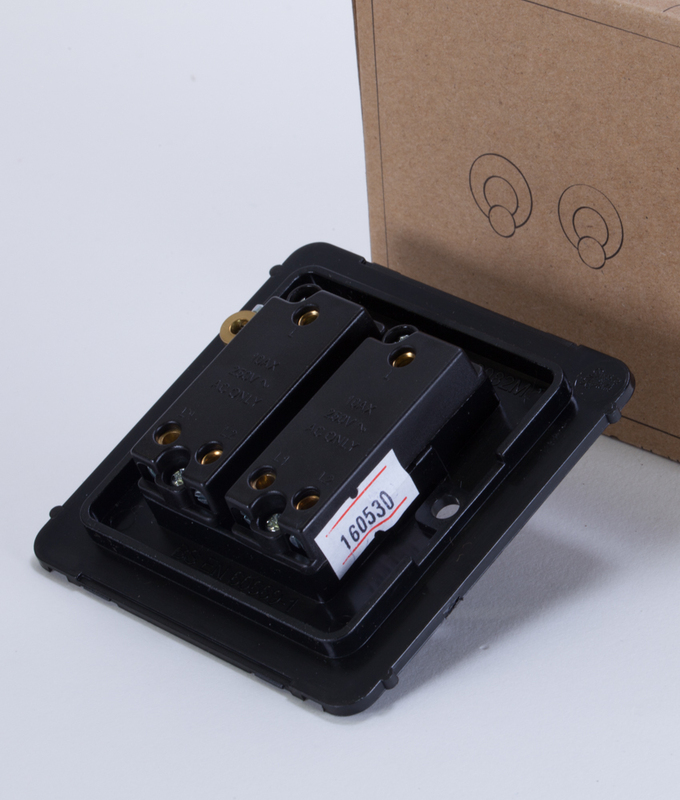 Install these 2 gang toggle switches to control your lights and you’ll be so glad you did. In fact, you can be content in the knowledge that you have exceptional taste every time you switch your lights on or off. We’ve created all of our designer light switches to be the perfect industrial style finishing touches to your interior décor. If you’re a fan of our gorgeous vintage light bulbs and have them strung from lengths of fabric cable then you’ll more than likely love these switches to complete your look. After all, vintage details are clearly your thing. If you do love this double toggle silver switch, check out the matching single toggle switch and our other co-ordinating silver light switches and plug sockets. Why not have a read of our guide light switches explained and find out the difference between 1, 2 & 3 gang as well as when to use 1 way, 2 way and intermediate switches.